CAN-AM Fabricated Steel Sprockets are made in C1045 plate Induction Hardened or heat treated plate with hardness's from 400 to 500 BHN are available. Please specify which material you require. Unless otherwise requested, O.D. of hubs will be sufficient to accommodate bore and keyway desired. Keys are not supplied with these items unless requested or unless mounted on shafts. Split-for-welding or split for bolting sprockets provide an economical means of mounting sprockets on shafts where it is prohibitive to dismount the shaft assembly. Many sizes of sprockets are stocked with bores, keyways, and set screws already provided. Plates or partially finished sprockets are also stocked. 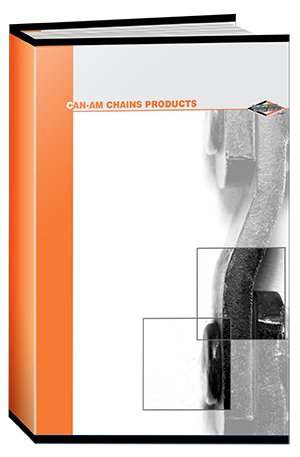 In the case of long link sprockets and idlers, please specify the size of chain that will be used. Brass and nylon bushing material is stocked for immediate insertion.